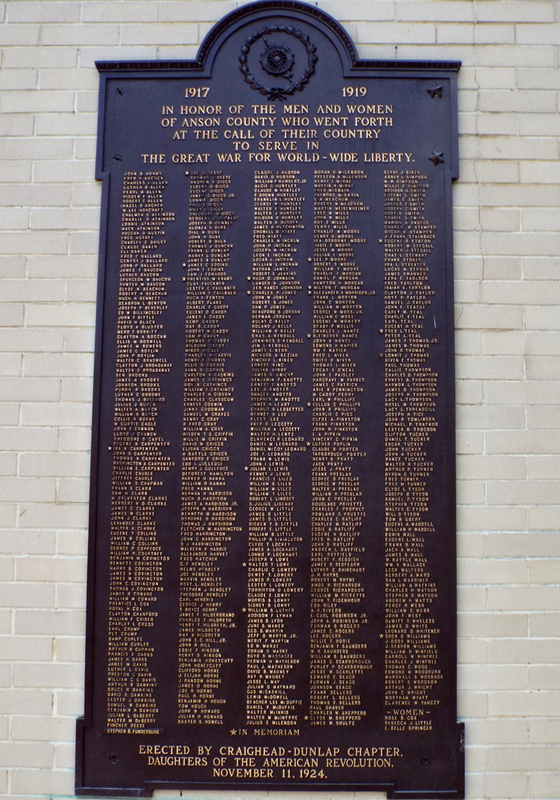 A rectangular bronze plaque mounted to an exterior wall of the Anson County courthouse lists the names of white men and women who served during World War One. A symbol for the Daughters of the American Revolution surrounded by a wreath is at the top of the plaque with inscriptions and names listed below. 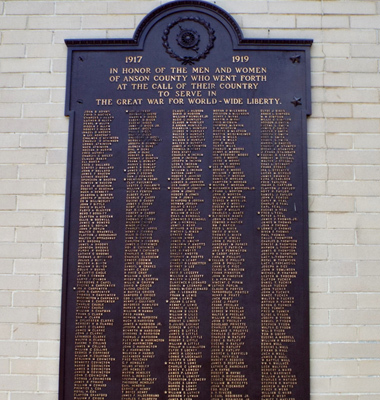 A similar bronze plaque lists the names of African American men and women who served during WWI. Bottom: ERECTED BY CRAIGHEAD-DUNLAP CHAPTER, / DAUGHTERS OF THE AMERICAN REVOLUTION, / NOVEMBER 11, 1924. Josephus Daniels, former Secretary of the Navy under Woodrow Wilson, was the featured dedication speaker. Gold Star War Mothers, Confederate veterans and other patriotic groups participated in the dedication. Afterwards those in attendance were treated to a picnic and barbecue. Efforts to obtain a full and correct list of all men and women from Anson County who served delayed the project. It is not certain that the dedication ceremony took place on November 11, 1924, as indicated on the plaque. The Anson County Courthouse is located on N. Greene St. between East Martin and East Wade Streets. The bronze plaque is mounted on the exterior wall of the entrance to the courthouse, a few feet to the right of the front doors. A companion listing for African American men and women is mounted on a similar plaque, on the left exterior wall. Multiple memorials are associated with the Anson County Courthouse area. The Confederate Monument sits in front of the entrance to the Courthouse and the Confederate Women Monument is on the left. The Anson County Veterans Memorial is in front and to the right. A pair of flag poles with a bronze plaque dedicated IN MEMORY OF HOYT PATRICK TAYLOR, a former NC Lt. Governor, is to the left of the Veterans Memorial. Also nearby is a Memorial Fountain dedicated to citizens of Anson County who died in World War One and to the heroes of the American Revolution.